The Pyramids of Giza are an important part of ancient Egypt, as well as present-day Egypt. Many people visit Egypt each year to see the pyramids in order to get a glimpse into Egypt’s ancient past. They consist of the pyramids and funerary complexes of the pharaohs Menkaure, Khafre, and Khufu. The Great Pyramid is the oldest of the Seven Wonders of the Ancient World and the only one to remain largely intact. It was built for Pharaoh Khufu (Cheops in Greek). Hemiunu, who served as vizier and royal seal bearer to Khufu, was probably responsible for building Khufu’s pyramid at Giza. Originally 481 feet (147 meters) tall, with each side about 755 feet (230 meters) wide, this structure took twenty years to build. 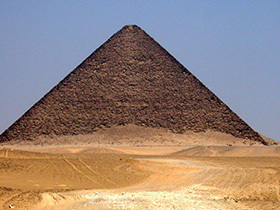 It is the largest pyramid ever built and is made of over 2.3 million limestone blocks – each weighing from 2.5 to 15 tons! At completion, the Great Pyramid was surfaced with white casing stones made of highly polished white limestone, which would have produced impressive reflections of the Egyptian sunlight. Through earthquakes and pillaging, most of the casing stones are missing today. Khufu’s son, Khafre, had his own, smaller, pyramid built during his reign, as did Menkaure. Together they created the famous Pyramids of Giza. No one is certain how these amazing pyramids were built. Many archaeologists believe that ramps were used and that stones were lifted using various tools, such as levers and sledges, by the work force that is estimated to have been around twenty thousand laborers. Despite popular myths, most experts believe the pyramids were built using conscripted labor, not slaves. Many Egytologists believe these pyramids were used as tombs; however, more information is being discovered and understood about their mystical purpose. Image: The Great Pyramid of Giza. Taken by the Rosicrucian Egyptian Museum.